I've been kind of obsessed with organization all my life so it was a real boon when I first read The Life-Changing Magic of Tidying Up: the Japanese Art of Decluttering and Organizing by Marie Kondo and learned all about the KonMari Method. The core concept of this transformative process draws upon organized minimalism as a path to happiness. KonMari isn't so much a cleaning process as much as it is an actual lifestyle. The principle behind KonMari is to only have things in your life that "spark joy" This may sound simple on the surface but it is actually a viable means to helping one get back to focusing on the important things in life. Clutter creates chaos. By eliminating excess clutter, you eliminate the internal clutter distracting you from what you truly value while also giving you more energy for them. Even though I've never been much of a pack rat and have no love for clutter, KonMari was an eye opener for me and really helped to take my decluttering to the next level as well as look at my possessions in a different way. Have you read The Life-Changing Magic of Tidying Up: the Japanese Art of Decluttering and Organizing? Would you adopt KonMari into your life? I have not read the book, but I do believe in a more minimalistic lifestyle. I guess I will keep this one on my list of possible presents for when my kids are older and adolescence kicks in. After reading your opinion I want to read it sound like a book I will enjoy. Such an interesting book! Thanks for sharing! But seriously, I thought it was amazing how her ideas were condensed into this manga. It was a fun read but it was still able to convey what her method is about. Have a great Monday, chingu! I read her original book and did the entire process and it's truly transformed my life. I def wanna read this one now! I believe in organization and keeping things minimal! It makes things much easier. LOL Rowena, you turned me on to this philosophy and it really works. I started reading the first book, but I haven't finished. I want to also get this one. Sounds so good. Thanks so much for asking about me! I kept watching Irma, because she kept moving west! I wish a hurricane on no one, but it took her forever to move North. We only received some wind gusts and it's a lot cooler here. But I had my bags out and ready if I had to leave. You're such a good friend Rowena ((HUG)) Thanks! I really need to read this book! It sounds so interesting to me because I also love organizing and anything to do with eliminating clutter! I will definitely be checking this out...thanks for sharing! Oh I am all about organization and I HATE clutter. It makes me nervous. This book sounds super interesting. I honestly don't know how people live with clutter. I really don't but this book should be the must have list for any hoarder. I seriously need to tidy up. I am such a pack rat also. My place is a mess of things I don't really need. Oh this is such a fun take on the book! I did buy the book as I was going to give it a go, but I have an emotional attachment to my clothes and so it's the hardest area to start with for me, not the easiest so I've not really gotten very far with it, haha! sounds good! I haven't read Marie Kondo book, but I'm a big fan of organizing and minimalism, trying to improove everyday! 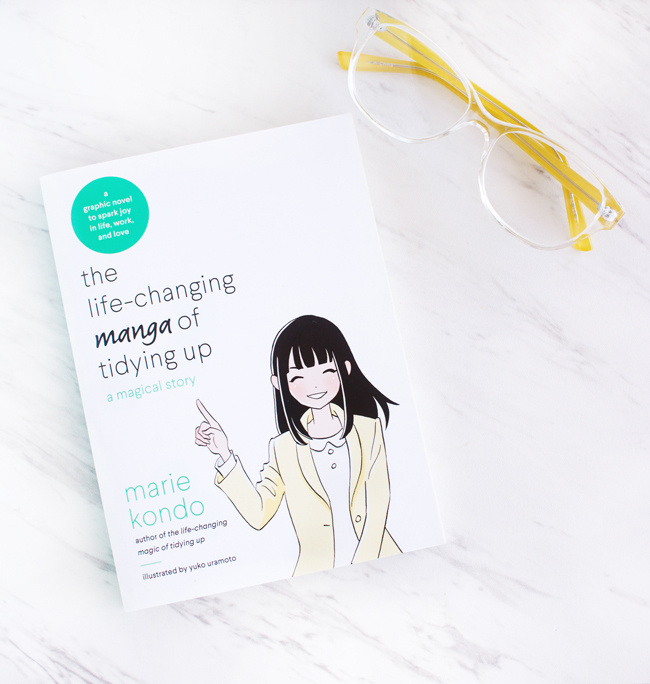 I read this and I am a fan of Kondo, I remember reading about her KonMari method and perspective on tidying up a year or so ago and I enjoyed it. I'm quite organised especially with my home and workspace. This would be a good gift as well. I have a couple friends who love the Magic of Tidying Up book so I think they would really love to read this graphic novel version. Thanks for sharing! I've been obsessed with organization as long as I can remember lol. This is a book I would like to read! I am in the process of cutting out crap or more appropriately giving away stuff that I know I won't use and stop impulse buying. My husband even noticed that I no longer buying clothes just because they are on sale or crazy buying makeup because it looks beautiful. It's baby step but I feel much better knowing that things that I have currently or investing in are things that will last for a long time to come and I get lots of use out of them. I have never read this book before. It sounds quite interesting though. I've read The Life-Changing Magic of Tidying Up and it's not only helped me declutter in a more effectively, but it's also transformed how I make my purchasing decisions. After all, if we should only keep things that spark joy, shouldn't we only buy things that spark joy? :) I would love to read the manga still though!